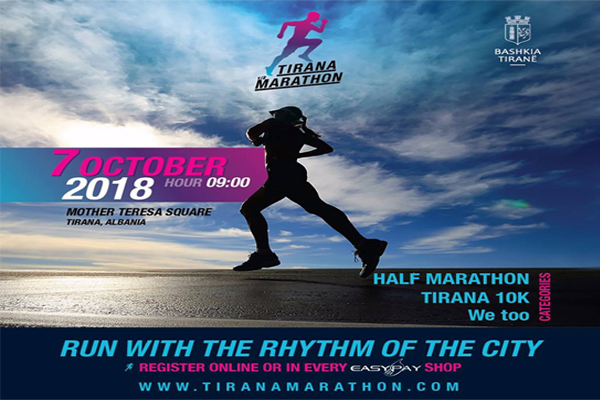 This year is the 3rd edition of Tirana’s Marathon and certainly we can entitle it as the biggest sport event in the city. This is also shown by the participation of more than 2500 runners from 40 different countries around the world. The increasing number of participants over the years is a good indicator that this competition has become desirable for the citizens of Tirana and beyond. The 3rd edition of this event, which is now becoming a tradition, is organized with the approval of two new itineraries from the World Athletics Federation, giving the reliability of an international activity and with the support of the Albanian Athletic Federation. The race will be held on October 7th and will have 3 categories; Half Marathon (21, 0975 km), Tirana 10K and “We too” this is a category that aims to be more motivating than competitive. On October 6th 2018, one day before the big race will be organized the “Fun Run”, a race between Tirana’s high schools students. With the “Fun Run” project we try to educate generations through sport, to be determined and confident, on their way to achieve goals. It is also a good way to encourage them in sports and start preparing, so that in few years they can compete in Tirana Half Marathon. The new itineraries, certified by the IAAF – International Association of Athletics Federations, will describe the city’s most attractive points, so that the race will not be only challenging but also fun. In addition to a sports event for the competitors, this may be considered a festive day for the city, because there will be organized many artistic and cultural activities on behalf of the event. Prizes for the winners will be quite tempting, turning the race into a challenge!